BHS Hardwood Battery Stations (HBS) are an ideal battery storage solution for BHS Gantry Cranes and other overhead extraction applications. These rugged stations have a heavy-duty frame and a powder-coat finish for added durability. The station’s recycled polyethylene decking is acid-resistant, nonconductive, and environmentally friendly. A tapered dust rail in the center of the stand prevents accumulation of debris and residue. Corner-formed Drip Pan Kits are available to catch spilled electrolyte and protect warehouse floors from pitting and corrosion. These custom-fitted pans slide in and out for quick and easy maintenance. A charger shelf comes standard on all models of the HBS. Anchoring slots fit most models of chargers and Cable Retractor mounting holes aid in cable management. 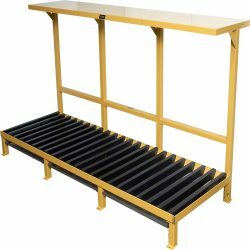 Models are available with a variety of shelf widths and can be custom-built to your specifications. Call 1.800.BHS.9500 to speak to our sales team or to find a local dealer.